Are the IPCC’s global-warming projections proving accurate? 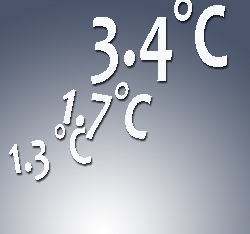 IPCC (2007, scenario A2) expects 3.4 C° manmade global warming to 2100. The calculations so far in this paper have assumed that the IPCC is right. Environment Canada does not ask any questions about the IPCC’s global-warming projections. Officials should have made some allowance for IPCC overshoot. Since 1750, whence IPCC dates our influence on climate, a recent study (Blasing, 2011) shows 3 W m–2 of forcing from our greenhouse-gas emissions, less –1 W m–2 from non-GHG influences (IPCC, 2007). Global temperature had risen by 0.5 C° from 1750-1983 (Hansen, 1984), with a further 0.3 C° since (HadCRUt3, 2011). Of this 0.8 C° warming, 50 to 100% may be manmade. Thus, the 261-year transient climate sensitivity parameter is (0.4 to 0.8)/(3 – 1) = 0.2 to 0.4 C° W–1 m2. Multiplying by the forcing at CO2 doubling, i.e. 5.35 ln 2 (Myhre et al., 2001, cited by IPCC, 2001, 2007), gives transient sensitivity of 0.75 to 1.5 C° by 2100, when CO2 concentration will have doubled. Dividing this value by 0.7, the fraction of all forcings attributable to CO2, allows for non-CO2 forcings. Expected warming would thus be 1.1 to 2.1 C° to 2100, 32 to 62% of IPCC’s central estimate. Since 1850, the year when the first global-temperature record was kept, the most rapid rate of warming sustained for more than a decade was 0.17 C°/decade (HadCRUt3, 2011). Assume that, after no warming in the 2000s, this maximum supra-decadal warming rate were to become the average rate for the next nine decades. 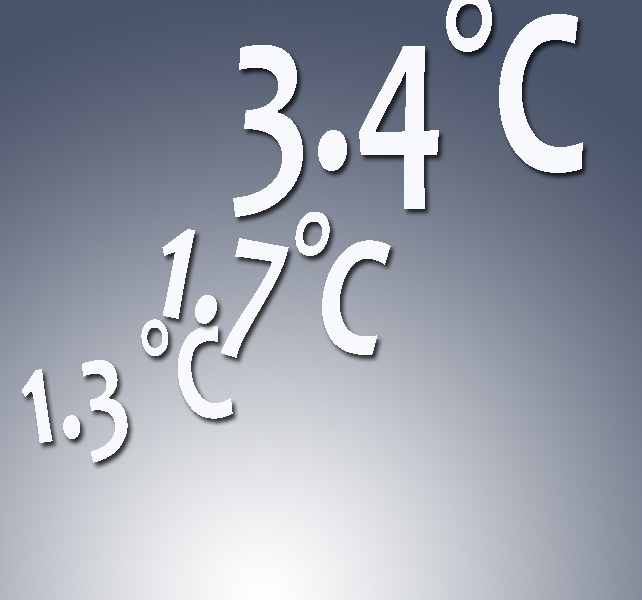 Warming would be 1.5 C° by 2100, 44% of IPCC’s central estimate. Since 1950, when Man first began emitting enough CO2 to influence the climate, 0.72 C° of warming has occurred (HadCRUt3, 2011). This rate, extrapolated from the past 61 years to the next 90, gives 1.1 C° of warming by 2100. Assuming 20 to 40% acceleration in the warming rate to allow for rising CO2 concentrations net of the logarithmic diminution in the CO2 forcing gives 1.3 to 1.5 C° warming to 2100. Averaging the results obtained from data over three recent periods by distinct methods gives 1.3 to 1.7 C° warming by 2100 – 40 to 50% of the IPCC’s estimate. A theoretical checksum: In Kiehl & Trenberth (1997), total forcing from H2O, CO2, CH4, O3, and N2O is given as 125 W m–2 in clear skies and 86 in cloud, or ~101 W m–2 overall. Holding insolation and albedo constant, the difference between surface temperatures with and without these GHGs is 288 – 255 = 33 C°. Ignoring minor forcings, climate sensitivity of the whole atmosphere is (5.35 ln 2)(33/101) = 1.2 C°, which, divided by 0.7 to allow for non-CO2 forcings, gives total warming at CO2 doubling by 2100 of 1.7 C°, or 50% of IPCC’s central estimate, more than halving the cost-effectiveness of the regulations. Disclaimer: Views expressed in a guest post are those of the author.